Even as public attention has been focused on the plight of Syrian refugees, the Obama administration has begun a wave of arrests and deportation of Central American families. Immigrant rights groups, who learned of the Department of Homeland Security’s plan to steadily increase deportations after the information was leaked to the Washington Post, protested in front of the White House on December 30th, decrying the move as an inappropriate response to a humanitarian crisis and warning of the potentially fatal danger it would be placing the refugees in. This past weekend, Immigration and Customs Enforcement (ICE) engaged in concerted, nationwide enforcement operations to take into custody and return at a greater rate than adults who entered this country illegally with children. This should come as no surprise. I have said publicly for months that individuals who constitute enforcement priorities, including families and unaccompanied children, will be removed. As of Wednesday morning, though, deportation procedures have been halted for 12 people picked up in Texas. According to Johnson, the number of families and unaccompanied children from El Salvador, Guatemala, and Honduras has surged in recent months after a slowdown, and the immigrants arrested over the weekend had exhausted all of their appeals against deportation. He also said DHS intends to continue the raids of the families, saying that they were deporting the families as humanely as possible. “Given the sensitive nature of taking into custody and removing families with children, a number of precautions were taken as part of this weekend’s operations. ICE deployed from around the country a number of female agents and medical personnel to take part in the operations, and, in the course of the operations, ICE exercised prosecutorial discretion in a number of cases for health or other personal reasons,” the secretary said. Of the almost 70,000 children apprehended as they tried to cross the U.S. border in 2014, 73 percent were from Guatemala, El Salvador, and Honduras. 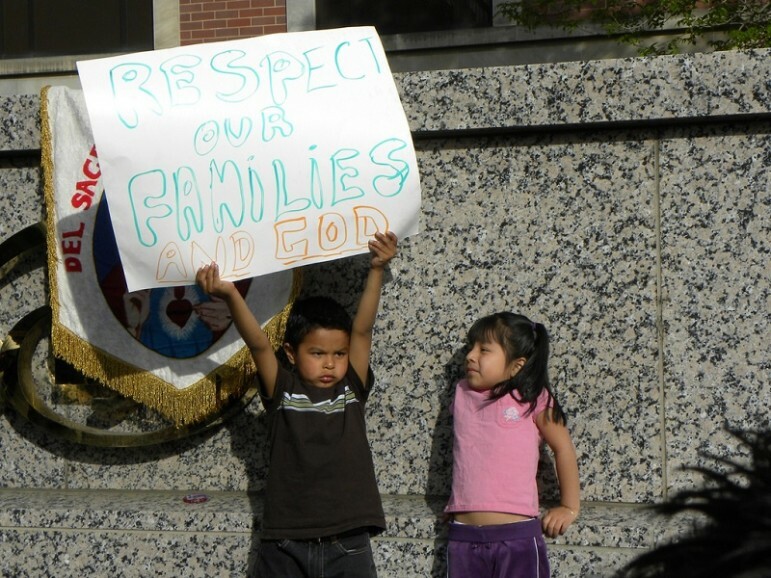 Despite recent U.S. legislation such as the DREAM Act (whose acronym stands for Development, Relief and Education for Alien Minors), DACA (Deferred Action for Childhood Arrivals) and DAPA (Deferred Action for Parents of Americans), Central Americans are considered a priority for deportation under the new Department of Homeland Security guidelines, which target the recently arrived and those lacking ties to anyone in the United States.